Thank you very much 2010. You well and truly left your mark. And I just want you to know it was a completely unexpected gift to end what was a superb holiday season. Something shiny, colourful and which took me completely by surprise. I would like to tell you it was the result of doing something exotic and adventurous but the truth is I got it because I offered to hang my daughter’s clothes out. I know, how could that simple yet well intentioned task have gone so wrong? My daughter lives in the inner city with a small balcony which masquerades as a backyard. So, given space limitations, she has a retractable clothesline. Child’s play she said when I asked her how to use it. I stretched the line out and attached it to the opposite wall. I hung up a sheet and …..then….. BAM. The clothesline retracted and smacked me hard in the face. Who knew a clothesline could become such a dangerous projectile weapon? I screamed. OK and screamed and screamed…..and screamed ….. Heads poked out of windows from apartments and shops all around to see what the noise was about. Possibly a new spate of gangland warfare? Oh dear. Sadly they were disappointed by the sight of a middleaged woman dancing in agony around the balcony, hand clutched tightly to her face believing she was now blind in one eye. This city has something of a reputation in the underworld department. And it goes without saying that I have something of a reputation in the drama queen department. Particularly when hit in the face by a wayward clothesline which was clearly holding out for an extended Christmas break and didn’t want to go back to work. I am just thankful that it’s summer and it’s not at all odd to be wearing dark glasses on a permanent basis. I could do without the pitying stares from people unsure if my injury was caused from having some very bad cosmetic surgery (given the bags and wrinkles remain) or if I was on the receiving end of someone’s ugly anger management issues. Who would guess a clothesline was the culprit? Regardless of black eyes, 2011 is off and running. I am full of anticipation and plans. I have earmarked this as my year of living differently (get that Mr Universe? That would be D-ifferently not D-angerously….). I have moved to Melbourne for a few months to experience one of the greatest cities in the world with more cities to come over the next year. That’s the plan. And you can be sure there will be some stories to tell. Strangely, there always is. Happy 2011 everyone and my wish for you is that those pesky, tightly coiled and highly strung clotheslines leave you and yours well and truly alone this year. And that you stay well and truly clear of them of course……. OUCH!!! See? Housework and exercise are dangerous dangerous dangerous and should never be done by amateurs. Wow though... glad I don't use a cloths line! I would have screamed (and screamed and screamed) as well. What an interesting (and painful) way to start the new year. So glad you are ok, Lilly, what a way to start the New Year! Hearing about all the flooding in Australia and thinking of your country with prayers. I've heard a lot of black eye excuses, but this one must be true. No one could make that up. Happy 2011, Lilly. Your stories are always told in the funniest most wonderful way! Happy New Year, Lilly! May this be your best year yet! thanks for sharing - if that is your eye, it looks painful. Too bad you didn't watch "Christmas Story" beforehand but then again that was a toy BB gun not a clothesline. Thing about accidents - they are typically NOT your best example of skill and grace. Did you slap a cold steak on it and pretend to be Lady Gaga? Well I guess you can see well enough to write the post - which has much more grace and skill than you clothes hanging activity. all the best - the future so bright you need to wear shades. Hello Lilly. Happy New Year. You have a grown-up daughter? Wow. Luckily the accident didn't hurt your eye. I've been to Melbourne and it is a great city. So homey and comfortable. Yikes! That looks really painful Lilly. I am so sorry, but now that you have the crazy part of the year out of the way-- The rest will be a walk in the park (fingers crossed). Congrats on your move and all your exciting plans. I look forward to living vicariously through your adventures. Happy New Year to one of the really great bloggers and friend. All the best to you and your family. I told you I didnt have a comfortable feeling about that rockstar looking person with tattered shirts. And Melbourne clothesline people clearly have something to learn from third world experts. If your daughter has a small balcony, why must they have a clothesline that moves left to right or vice versa? Vertical makes more sense. I too have a small balcony, actually called a "Drying balcony" , and instead of fast automatic surprises, we have an entire set of lines (with clothes) that we move up and down; down when we hang the stuff, and up when we are finished hanging. The stuff is tethered up there by a rope which i attach somewhere below, by using my non-trivial biceps and triceps. So far the eyes are fine. Maybe you need to plan a trip here, and we can get a piece like that for you to take back , so Jordan can throw the violent clothesline out. Having described all the engineering, I need to ask you if you have tried applying sandalwood paste below the eyes. It is supposed to be cooling, medicinal, and smells good. And may add the one missing color : yellow ochre. I hope the stuff heals soon and heals well. I thought I heard someone screaming but didn't realise they were in Melbourne!!! You poor bugger and who is ever going to believe that story when you tell them! Enjoy beautiful Melbourne my dear friend and take care and stay safe. Ohhh, way to have the year go out... with a bang! Ouch. Hope you are on the mend! I would love to have a life where I could pick up and move every once in awhile... you are uber cool and I can't wait to see what adventure finds you!! New Year's blessings to you! That is so well,,,,funny. I can just picture you. It must have hurt the schock of it would be worse than anything. Heavens we feel enough pain already when doing housework without any more thrown in for good measure.Hope you have the best fun exploring the world in 2011, you totally deserve it. Keep those dark glasses on until it heals. The shock must have been worse than the actual injury. Not one you would be expecting at all. Ouch! 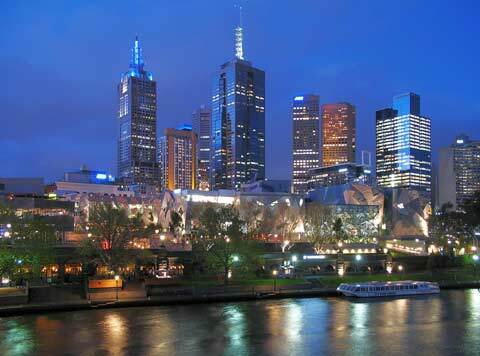 Have the best fun, Melbourne is indeed a beautiful city. One of the best! I cannot wait to find out where you will go next. @ joanie - you are so right, housework is for the professionals and i learnt my lesson and have given it up for 2011!! @ aleta - um not sure i could get away with that kind of makeup, he he. Mmmm, we all have dryers here but do like to dry our clothes outdoors when its sunny. Although I think I will be sticking to clothesdryers while living in my new abode anyway. @ Christine - yes there has been terrible flooding at the top end of Australia which has been terrible. The weather patterns are strange all over the world it seems. @ Richies - yep its true, unfortunate but true. And if I didnt have witnesses who were laughing at me at the time no-one would have believed me...yes they were laughing until they saw blood trickling down my face then they changed their tune, ha ha. @ Kay - thank you Kay you always say th enicest things which make my day! @ Lisleman - yes thats my eye and other than a small cut it was not that painful. What was painful was the memory of the smack in the face - it made such a loud noise and came out of left field. Its just bruising otherwise and will go away. No I didnt slap a cold steak on it but ice wrapped up in a towel. It bought the bruising out quicker supposedly. Thank goodness my sight is ok - no injuries other than a small cut just under the eye but as my daughter says any sign of it will be hidden in a wrinkle anyway - yes, she said it bless her. Enjoy Melbourne, the terrible restaurants, the dingy bars, the boring musicals and the AFL :) Can you tell I'm jealous? A VERY HAPPY NEW YEAR TO YOU, DEAR LILLY! May 2011 be everything you want it to ne, and more! Ouch ouch ouch! Here's to a pain-free 2011! Poor little Lilly! I know that hurt and it must have scared the ##$$% out of you. 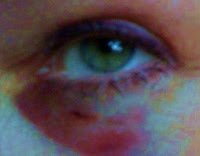 I have had one black eye in my life ~ hit with a softball during a game on a team I was part of in my mid-40's! Glad those days are behind me. @ Ugich - well now you have me curious and I would like to see your clothesline. How about a post on it? Perhaps its similar to ones you see in New York that you wonder how the hell they got their clothes up there? I would like to plan a trip your way definitely. Yes, the sight is fine and other than a small cut its just bruising - I out ice on it straight away and the bruising came out and is nearly gone apart from one stubborn patch - no problems just a little careless on my part to assume I knew what I was doing! Because it is winter for me, and particularly frigid tonight, and I have never visited this blog before, I was anticipating that a slip on ice or something of that nature led to the injury ! I hope the healing is swift and I thank you for your writing...It certainly is graceful, as someone else commented ! Greetings from Rhode Island, U.S. I think you should go with "my boyfriend socked me in the eye for mouthing off." How long does it take for a black eye to disappear? Just imagine all of the conversation starters taking place. Looking forward to hearing about your adventures in Melbourne. Yeah... nasty that... you weren't listening to cricket commentary at the time, were you? Melbourne was inundated with english accents, happy ones at that...oh dear whenever I saw the red and white colours anywhere I knew it was the Barmy Army and time to cross the road....what fun they had...at our expense of course..I love the rivalry mind you but it's hard being a loser lets face it!! I wasn't able to comment on today's post so I have to do it here. You are the best, Lilly. Your posts are like solid chocolate Easter bunnies. Every bite, a treat! Gosh! I haven't seen many Easter things up yet here in Hawaii, just Valentines Day. I imagine they'll get to it the hour after Valentines. Oh no you have to put comments back on you are hilarious, Jesus Christ indeed!